Sleep Study Received – We Got This! I received the official sleep study summary yesterday afternoon. I know what everything means, but I’m still trying to figure out how to practically apply it. I thought I’d share it with everyone and see what thoughts you might share. At the bottom of page #2 is a summary of what is considered “normal” for various measurements. I’ve summarize it (below) to make it easier to evaluate. Updated: December 28, 2012 to include Sleep Study performed on 12/12/12. Perhaps most encouraging from the study is Ryan does, indeed, experience sleep and not some form of “permanent hibernation” (that’s my chose of words). My frustration with the report is it’s too general. For instance, he has mild levels of arousals… but what caused these? I suspect most can be attributed to us tending to him. Yes, we try to group these task together (eye, oral, shifting, water, etc.) to reduce disturbance to his sleep, so what is the difference? Can we be more effective? 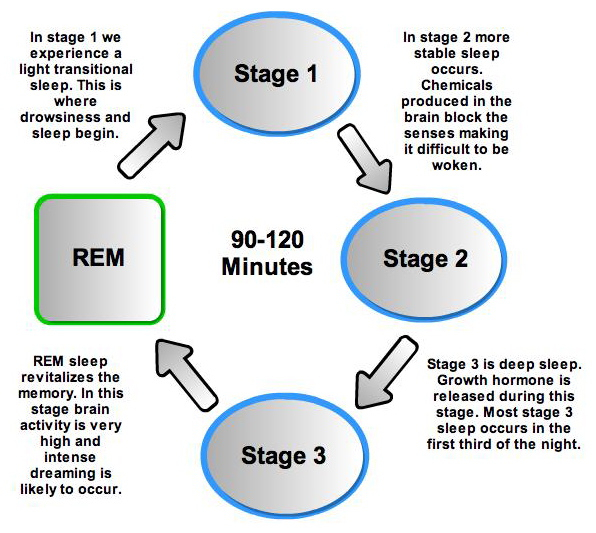 Does this explain the shift in his sleep architecture (i.e., sleep stages) ? I suspect it inhibits him from reaching REM (since we break his sleep cycle), but I need proof. With this in mind, I requested (much) more detail. I want it all! I am educated and have practical knowledge of statistics, so I want the data so raw it reeks. I’ll be more comfortable with my analysis and conclusions. Thank you for sharing with us, Ken. I will leave this one to the experts. I am a light sleeper, and awaken every two hours, or at the end of each sleep cycle. This is what happens to many of us who are older, but the young sleep like ricks most of the time. I would think that any movement around Ryan would disturb his sleep, but I don’t know how it can be avoided during the night. Happy snow — sounds like you might be in for it! Love and prayers. Very interesting information this morning. Learned details about the sleep cylce than I did not know. Good to see Ryan does rest and ratings categories appear in line. Thank you for sharing. I’m assuming you are already timing your caregiving to be at 90 minutes cycles once he has fallen asleep, and you’ve already mentioned that you are turning off the TV once he’s in bed. Have you considered a white noise machine? Perhaps this would help establish the unobtrusive background noise needed to allow for more restfull sleep. You could turn off the machine a couple minutes before doing the caregiving, so he could begin to rouse himself naturally. Good luck at finding a way to help him obtain more peaceful sleep. SHSP. Great to see Ryan experiences a somewhat normal sleep pattern. Reading the description above of REM revitalizing memory, it would seem that is very important for Ryan to achieve uninterupted. Since the average person gets a full, restful night’s sleep with few interuptions, my VERY unprofessional opinion would be that this pattern would be very beneficial to Ryan. I know you have to do things for him round the clock, so that makes it tough to achieve the optimum sleep pattern. I just wonder what difference it would make if Ryan’s schedule was kept quieter all night? More fun facts… Pretty sure Ry’s dreams are filled with Ken, Kari and Sue! Blind People also Dream – People who became blind after birth can see images in their dreams. People who are born blind do not see any images, but have dreams equally vivid involving their other senses of sound, smell, touch and emotion. I would say to weigh the care he is getting during the night to the uninterrupted sleep he requires. There have been studies done showing poor sleep patterns cause a variety of illnesses and diseases so it may be more important that you let him sleep and you and your wife get the sleep you both need also. Baby monitors are fantastic and could be used to hear everything that goes on with Ryan. Even if it was being set up in an adjoining room, or even a space far enough away would allow restful sleep for Ryan. That way, Ken could go ahead and keep the t.v. on without disturbing Ryan if he wants, but ready to spring into action if needed. Hi Ken, I’ve been mulling over the sleep study results. I am very interested in hearing what the doctors have to say about it. The fact that so many parts of the study indicate normal processes is indeed very encouraging!! Considering the severity of Ryan’s injuries, it reinforces my belief that his brain is making a slow but steady recovery. Look at our boy, he is an amazing young man!! Hoping you, Sue, Ryan, Duke and Tucker have a nice day together. Thinking of you! !